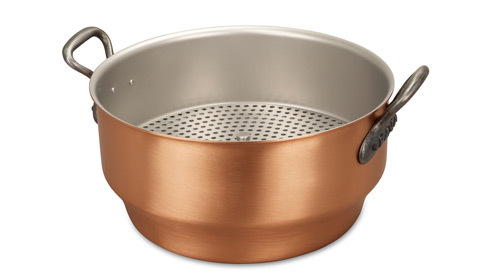 We know you'll love this	28cm copper steamer	as much as we do. Beautiful Pot I just received this pot and I'm very happy with it! Not only is it perfect for steaming vegetables but it is a good size for things like soups and stews. Of course the quality is second to none. I own quite a few Falk pieces and they are the best pans I've ever used. I must also say that the customer service I've received from Neil Corke every time I've ordered has made the process absolutely painless! It is a pleasure to do business with this company! 994 customers found this review helpful. Did you? Yes, I did! Awesome piece of kit! Beautifully made and perfect for steaming all kinds of vegetables. I have also used this as a large pot for soup.